Here, we present a new technique to culture chick embryos ex ovo for time-lapse imaging using transmitted light and fluorescence microscopy. The submerged filter paper sandwich is a variant of the well-established filter paper carrier technique1 that allows for the culturing of chick embryos fully-submerged in a liquid culture medium. Schmitz, M., Nelemans, B. K., Smit, T. H. A Submerged Filter Paper Sandwich for Long-term Ex Ovo Time-lapse Imaging of Early Chick Embryos. J. Vis. Exp. (118), e54636, doi:10.3791/54636 (2016). Due to its availability, low cost, flat geometry, and transparency, the ex ovo chick embryo has become a major vertebrate animal model for the study of morphogenetic events, such as gastrulation2, neurulation3-5, somitogenesis6, heart bending7,8, and brain formation9-13, during early embryogenesis. Key to understanding morphogenetic processes is to follow them dynamically by time-lapse imaging. The acquisition of time-lapse movies of chick embryogenesis ex ovo has been limited either to short time windows or to the need for an incubator to control temperature and humidity around the embryo14. Here, we present a new technique to culture chick embryos ex ovo for high-resolution time-lapse imaging using transmitted light microscopy. The submerged filter paper sandwich is a variant of the well-established filter paper carrier technique (EC-culture)1 and allows for the culturing of chick embryos without the need for a climate chamber. The embryo is sandwiched between two identical filter paper carriers and is kept fully submerged in a simple, temperature-controlled medium covered by a layer of light mineral oil. Starting from the primitive streak stage (Hamburger-Hamilton stage 5, HH5)15 up to at least the 28-somite stage (HH16)15, embryos can be cultured with either their ventral or dorsal side up. This allows the acquisition of time-lapse movies covering about 30 hr of embryonic development. Representative time-lapse frames and movies are shown. Embryos are compared morphologically to an embryo cultured in the standard EC-culture. The submerged filter paper sandwich provides a stable environment to study early dorsal and ventral morphogenetic processes. It also allows for live fluorescence imaging and micromanipulations, such as microsurgery, bead implantation, microinjection, gene silencing, and electroporation, and has a strong potential to be combined with immersion objectives for laser-based imaging (including light-sheet microscopy). Embryogenesis has fascinated man since the beginning of history. How do the structure and morphology of an embryo develop in such a well-defined temporal and spatial manner? The chick embryo has become one of the classical vertebrate animal models for embryogenesis for several reasons: It is easily available, inexpensive, transparent in its early stages, and accessible for experimental manipulations, as it develops outside the mother. Moreover, it has an almost flat geometry during early morphogenetic events, such as heart and brain formation, gastrulation, neurulation, and somitogenesis15. Morphogenetic processes can be understood best if they are studied dynamically, such as through the acquisition of time-lapse images. The chick embryo can be visualized in ovo16 but with poor accessibility for experimental manipulations and limited visibility for transmission light microscopy imaging. Therefore, several techniques have been proposed to culture chick embryos ex ovo, either in whole yolk culture systems13,17-19 or as explant cultures1,20-23. In whole yolk culture systems, the embryo remains on top of the intact yolk, and the whole content of the egg is transferred to another container for incubation. This container can be a surrogate egg shell17, a Petri dish19, or a hammock made of plastic cling wrap13,18. Embryos in whole yolk cultures can ideally be cultured until hatching and are accessible to micromanipulations. These techniques are especially useful for studying the development of embryos after the initiation of blood circulation (which increases the contrast), while younger embryos remain hard to visualize. These early embryos can be imaged best if they are excised from the yolk and cultured as in vitro explants. The explants are easily accessible for experimental manipulations and require less space for culturing. For many years, a technique pioneered by Denis New in 1955 and its variations were the golden standards of explant culture methods for chick embryos, thereby making the embryo accessible for time-lapse microscopy and microsurgical interventions20,21. Despite its great success, New's technique is relatively demanding and time consuming. The blastoderm often detaches when the vitelline membrane, carrying the blastoderm, is stretched around a glass ring to achieve the proper tension1. Moreover, the embryo can only be cultured with its ventral side up. The EC (Early Chick) culture, a more recent technique developed by Chapman and Collignon1, circumvents the stretching of the vitelline membrane by using a filter paper carrier with a central aperture. The filter paper attaches to the vitelline membrane, thereby maintaining its natural tension, and surrounds the embryo like a picture frame1. Embryos are then cultured on an agar-albumen bottom, usually with their ventral side up. 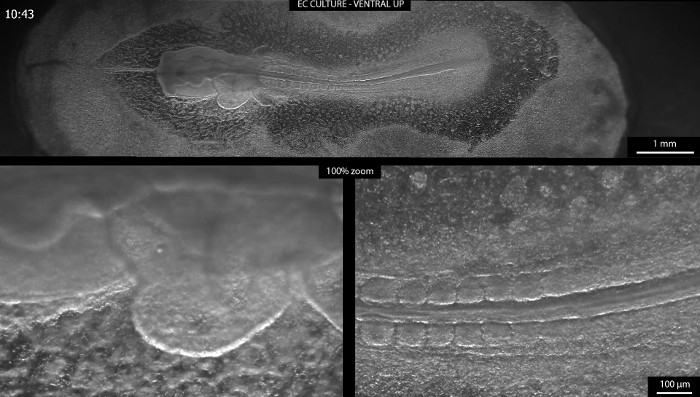 Culturing dorsal side up seems only possible for embryos at HH815 and older. Many groups have adapted the filter paper carrier to their needs, such as by replacing the agar-albumen bottom with a support made from surgical suture fibers24 or a collagen coated membrane25. Often, embryos cultured with New's technique or with the EC culture are exposed, with their dorsal or ventral surface to air to facilitate oxygen diffusion1,20. These explant cultures have to be kept in a humidified atmosphere to avoid evaporation of the medium and to prevent the embryo from drying out. This is achieved by incubating the dish with the explant culture in a larger Petri dish containing moistened tissue paper1. The acquisition of time-lapse images of these embryos requires either the use of a climate-controlled incubator around the whole microscope or a temperature-controlled container with a heated lid to prevent condensation in the light path14. However, chick embryos can also develop ex ovo completely submerged in culture medium as filter paper cultures25, sandwiched between a layer of heavy mineral oil and albumen in adaptions of New's technique2,21, or as folded blastoderm explants in the "Cornish Pasty Culture"23,26, without direct contact with the air. The submerged filter paper sandwich is a new variant of the filter paper carrier technique. By combining earlier knowledge on culturing chick embryos ex ovo, it makes the climate-controlled incubator and the heated lid dispensable. The embryo is sandwiched between two identical (laser-cut) filter paper carriers24 and cultured fully submerged in a simple culture medium (Pannett-Compton saline27,28 and thin albumen in a 3:2 ratio) in a temperature controlled container. A layer of light mineral oil floating on top of the medium prevents evaporation2,21 and minimizes heat loss to the environment. The bottom of the container has a glass window, and the whole setup is performed on an upright long working distance zoom microscope. This setup allows the acquisition of high-resolution brightfield and darkfield time-lapse movies of about 30 hr of embryonic development, ranging from the early primitive streak stage to the 28-somite stage (equivalent to Hamburger Hamilton stages 5 to 16, HH5-16)15. Embryos can be cultured equally well with their ventral or dorsal side up. Therefore, embryos are accessible to observation and manipulation of ventral (e.g., early heart7,8 and somitogenesis6) and dorsal (e.g., late gastrulation2, neural tube closure3-5, and early brain9-13) development. The submerged filter paper sandwich provides a simple and stable environment for microsurgery, bead implantation, microinjection, gene silencing, and electroporation studies. Its imaging potential can be pushed much further by using laser-based imaging (including light-sheet microscopy) and immersion objectives. All experimental procedures were conducted in accordance with the Netherlands Experiments on Animals Act. NOTE: The submerged filter paper sandwich method is modified from 1. Prepare stock solutions A (1 L of ultrapure H2O, 121 g of NaCl, 15.5 g of KCl, 10.42 g of CaCl2·H2O, and 12.7 g of MgCl2·6H2O) and B (1 L of ultrapure H2O, 2.365 g of Na2HPO4·2H2O, and 0.188 g of NaH2PO4·2H2O) in clean 1-L bottles. Store them at 4 °C. Prepare 1 L of PC-saline by mixing 900 ml of ultrapure H2O with 40 ml of stock solution A and 60 ml of stock solution B (in this order to avoid precipitation). Prepare PC-saline freshly from stock solutions A and B every week. NOTE: Stock solutions can be stored at 4 °C for several months. Autoclaving and/or adding antibiotics or antimycotics are not necessary. In a humidified incubator, lay the eggs on their side and incubate them at 37.5 °C until they reach the desired age. If available, use a laser cutting machine to cut hourglass-shaped filter paper carriers from thick filtration paper (28 mm x 22 mm). Taper the width in the middle from 22 mm to 10.4 mm. Cut out a central elliptical aperture (10.6 mm x 5.5 mm), with the longer axis of the ellipse orientated parallel to the larger side of the filter paper carrier (Figure 1-M). Optionally, prepare a cardboard stencil with the correct dimensions and transfer its outline and that of the central aperture to thick filtration paper using a pencil. Cut out the filter paper carrier using fine scissors. Cut two identical filter paper carriers for each embryo to be explanted. Prepare extra filter paper carriers as backup in case an embryo gets lost during explanting. Place the temperature-controlled beaker in the center of the motorized x-y-stage of the upright zoom microscope and connect the beaker to its temperature controller. Put four large stainless steel rings (30 mm outer diameter, 4 mm in height, 1.5 mm wall thickness) into a 6 cm Petri dish to act as weights and place the dish in the middle of the temperature-controlled beaker. NOTE: This Petri dish just serves as a placeholder to adjust the oil level. Fill the temperature-controlled beaker with 130 ml of light mineral oil. Adjust the oil level if necessary so that it ends about 3 mm below the upper edge of the 6 cm Petri dish. Remove the 6 cm Petri dish from the temperature-controlled beaker and set the temperature to 40 °C. Pour 30 ml of PC-saline (as prepared in steps 1.1.1 to 1.1.2) into a 50 ml centrifuge tube. Prepare one 50 ml centrifuge tube filled with 30 ml of PC-saline for every two embryos to be explanted. Carefully crack a non-incubated egg into a 10 cm Petri dish. Harvest thin albumen by moving a plastic transfer pipette along the walls of the Petri dish and sucking in the thin albumen. Collect 30 ml thin albumen in a 50 ml centrifuge tube for each two embryos to be explanted. Make sure to obtain only the thin albumen. NOTE: Usually 3 - 4 eggs allow the harvest of about 30 ml of thin albumen. Pour 20 ml of thin albumen into every PC-saline filled 50 ml centrifuge tube (as prepared in step 2.1.1). Mix the PC-saline with the thin albumen by gently inverting the tubes several times. Let it settle for several minutes and check if the mixture, called culture medium from here onwards, is clear. If the culture medium is not clear, prepare fresh PC-saline from the stock solution and harvest fresh thin albumen. Place two small stainless steel rings (20 mm outer diameter, 4 mm in height, 1.5 mm wall thickness, 6.5 mm gap in the ring) as far apart as possible in a fresh 6 cm plastic Petri dish and fill it with 22 ml of culture medium (as prepared in steps 1.4.1 to 1.4.4) using a 25 ml plastic pipette (Figure 1-H). Make sure that debris accumulated on top of the medium remains in the centrifuge tube. Remove any debris or bubbles from the medium using a plastic transfer pipette. Fill a 10 cm Petri dish with 75 ml of PC-saline (to be used in step 2.15). Remove an egg from the incubator and let it rest on the bench on its side for 1 min to let the embryo come to the top of the yolk. Carefully crack the egg into a Petri dish (Figure 1-A). Soak the edge of a piece of fine tissue paper in the thick albumen and center the blastoderm by pulling, if necessary. Remove most of the thin and thick albumen from the Petri dish using a plastic transfer pipette (with the tip cut off to facilitate the uptake of the thick albumen). Create a window in the thick albumen around the embryo by gently wiping away the thick albumen with a piece of tissue paper, moving away from the center (Figure 1-B). Prevent the tissue paper from attaching to the vitelline membrane. Using tweezers, carefully place a filter paper carrier on the vitelline membrane around the embryo, with the longer axis of the elliptical aperture parallel to the anterior-posterior axis of the embryo (Figure 1-C). Pinch one tip of the nail scissors through the vitelline membrane close to the filter paper carrier and quickly cut around the whole filter paper carrier (Figure 1-D). Using tweezers, lift the filter paper carrier away from the yolk in an oblique direction parallel to the anterior-posterior axis of the embryo (Figure 1-E). Turn the filter paper carrier around to have the ventral side of the embryo on top and submerge it in the PC-saline. Immerse the filter paper carrier along the anterior-posterior axis of the embryo in an oblique direction. Get rid of all the yolk still attached the vitelline membrane and the blastoderm by gently flushing it with PC-saline from a plastic transfer pipette. Keep the entirety of the filter paper carrier submerged at all times (Figure 1-F). Remove the filter paper carrier from the PC-saline along the anterior-posterior axis of the embryo in an oblique direction and get rid of the excess liquid by dabbing the edge of the filter paper carrier on a tissue paper. Hold the filter paper horizontally, with the ventral side of the embryo facing up, and place another filter paper carrier on top of the first one, using a second pair of tweezers. Their apertures should match exactly, thereby sandwiching the embryo between the two layers of filter paper (Figure 1-G). Immediately submerge the filter paper carrier sandwich into the culture medium in an oblique direction along the anterior-posterior-axis of the embryo. Place it in the area spanning the space between the two steel rings (Figure 1-H). Fix the filter paper sandwich by placing two more steel rings on top of the other two, making sure that the aperture with the embryo remains completely uncovered (Figure 1-I). Check the medium level and make sure that the upper spacer is just submerged in the medium. If necessary, add or remove small amounts of medium. Carefully place the Petri dish in the center of the temperature-controlled oil bath and stabilize the dish laterally by placing three large stainless steel rings (30 mm outer diameter, 4 mm in height, 1.5 mm wall thickness) next to the dish in the oil. Make sure that the steel rings touch the sides of the dish (Figure 1-J). Slowly pipette approximately 6 ml of light mineral oil on top of the medium with a plastic transfer pipette, so that the medium is covered with a continuous layer of mineral oil (Figure 1-K). Set up the time-lapse acquisition. NOTE: Imaging the embryos as horizontal panoramas of five overlapping sub-images (tiles) allows detailed imaging (5X objective), with a general overview of the morphology29-30. Imaging intervals between 3 and 10 min allow for the detailed tracking of morphological changes31, and the acquisition of small z-stacks (five to seven different planes with a distance of 30 µm) compensates for much of the thickening and turning of the embryo30. Z-planes with the highest contrast can be selected before further processing32 of single frames into time-lapse movies (see the Representative Results section for detailed information on image acquisition). Figure 1: Setting up the Submerged Filter Paper Sandwich. (A) An egg is cracked into a Petri dish. (B) Most of the thick and thin albumen is removed from the Petri dish with a plastic transfer pipette (not shown). Then, a window in the thick albumen is created around the embryo by gently wiping away the thick albumen with a tissue paper. 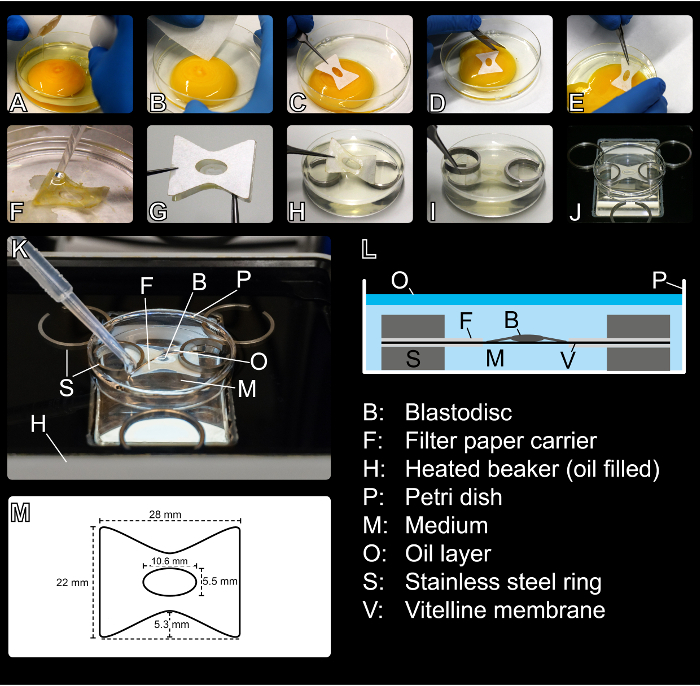 (C) A filter paper carrier is placed around the blastoderm on top of the yolk. (D) The filter paper carrier is cut loose from the surrounding vitelline membrane and (E) removed from the top of the yolk. (F) The remaining yolk is carefully washed away in a PC-saline bath. (G) The embryo is sandwiched with a second identical filter paper carrier. (H) The filter paper sandwich is submerged in the medium and positioned on two metal stainless steel rings (embryo facing dorsal or ventral side up). (I) Two rings stabilize the sandwich from the top. (J) The Petri dish containing the embryo is transferred to the temperature-controlled oil bath. Stainless steel rings stabilize the Petri dish laterally. (K) The culture medium is covered with a layer of mineral oil. (L) Schematic of the submerged filter sandwich. (M) Dimensions of the filter paper carriers used for the submerged filter paper sandwich. Please click here to view a larger version of this figure. Figure 2: Morphological Comparison between Embryos in EC Culture1 and in Submerged Filter Paper Sandwich Culture. Selected time-lapse frames show the embryos at 3 hr intervals. Frames are resized to give an overview of full embryo morphology. Embryos were age-matched to the 7-somite stage (HH9)15. 0 hr indicates the start of each experiment. Anterior is always to the left. Images were acquired using darkfield illumination. (A) Embryo in EC culture1, cultured ventral side up on an agar-albumen bottom1,33. High-quality images can be acquired, as the embryo is confined in the z-direction. (B and C) Two embryos cultured in the submerged filter paper sandwich: (B) Ventral side up and (C) dorsal side up. Embryos in the filter paper sandwich develop without qualitative differences for at least 27 hr. They develop functional blood circulation and cranial and cervical flexure and turn successfully. Please click here to view a larger version of this figure. Time-lapse acquisition depends on the microscope system available. In this study, a long working distance, upright zoom microscope was used. The zoom factor was set to 5X. In combination with the 16X magnification of the eyepiece, this resulted in 80X total magnification, with a theoretical resolution of 1.3 µm/pixel (as stated in the microscope software)30. To increase the field-of-view, embryos were imaged as horizontal panoramas of five sub-images (tiles). Therefore, a tile region, consisting of five overlapping tiles, was defined29. This tile region was positioned so as to fully cover the elliptical aperture of the filter paper carrier in its horizontal extension (Figure 2B - 0 hr). Each tile had a size of 2,048 x 2,048 pixels, covering a field-of-view of approximately 2.7 mm, and tiles were acquired with an overlap of 10%, resulting in total field-of-view of approximately 12 mm x 2.7 mm for the panorama. The motorized x-y-stage moved relative to the objective with a speed of approximately 1.75 mm/sec between acquisition of the separate tiles29. The live image was focused on the anterior presomitic mesoderm and the most recently-formed somites (the research focus of our group). To compensate for the thickening and curling of the embryos in the z-direction, small z-stacks (five to seven different planes with a distance of 30 µm) were acquired at every time point30. These were selected around the focal plane of the anterior tip of the presomitic mesoderm. The duration of the time-lapse acquisition was set to 50 hr, and imaging intervals of 3, 4, or 10 min were chosen31. The quality of the time-lapse acquisition could be improved by refocusing every 5 - 10 hr and redefining the z-stack around the new optimal focal plane. At the end of the experiment, the whole time-series was edited manually, and subsets of images containing the z-plane with the best focus were created and saved to a separate folder32. These subsets of images were time-stitched to create a complete time-series of images with optimal focus. The tiles of each image of this complete time-series were stitched and fused together without shading correction30, and time-lapse frames were exported as JPEG-images of 100% size and 95% compression32. The time-lapse frames were imported as an image sequence into professional video-editing software. The detailed 100% zooms were stabilized, and the overall contrast was adjusted to our liking. The final time-lapses were encoded with the H.264 codec and exported in MPEG-4 containers. Movies are displayed at a frame rate of 15 frames/sec (fps) and a resolution of 1,920 x 1,080 pixels. 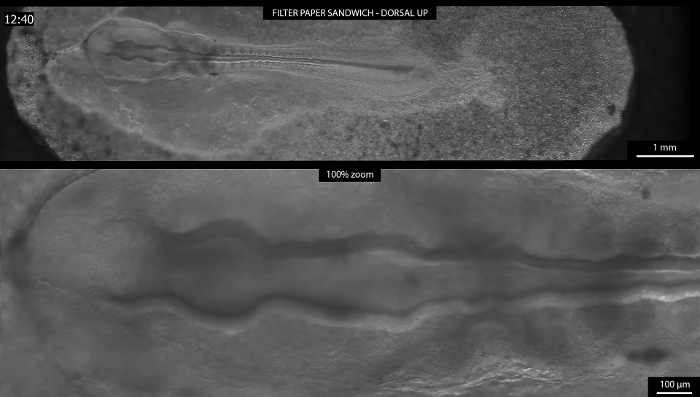 Figure 2 shows a comparison between an embryo in EC culture1 (Figure 2A) and two embryos in the submerged filter paper sandwich culture, one being cultured ventral side up (Figure 2B) and the other one dorsal side up (Figure 2C). All embryos were age-matched to the seven somite stage (HH9)15 and imaged with a temporal resolution of 4 min (Figure 2A and B) or 10 min (Figure 2C). Selected frames of 3 hr intervals are depicted. The EC culture (Figure 2A) allowed very stable imaging due to the embryo resting on a stable agar-albumen bottom1,33. The entire embryo remained in one focal plane throughout the whole time-lapse. This could be beneficial for shorter experiments (several hours) and very early embryos, but it comes with a strong confinement of the embryo in the z-direction, possibly hindering its successful three-dimensional development in the long term. 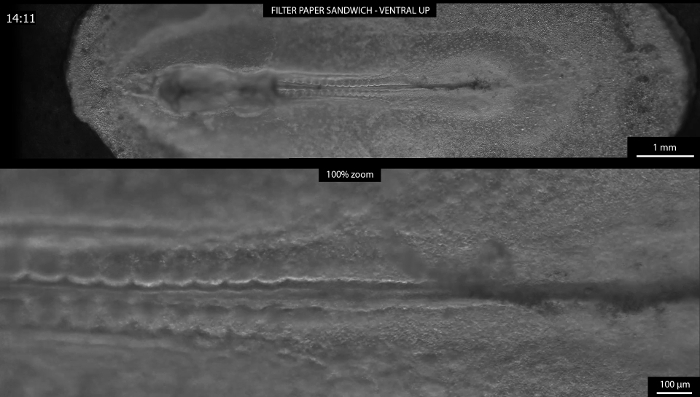 In the beginning, the confinement only resulted in a slight lateral flattening of the embryo's head compared to an embryo cultured in the submerged filter paper sandwich with its ventral side up (compare Figure 2A and 2B at 0 hr). Later, the turning of the head was impaired (Figure 2A - 21 hr) and the heart beat slowed down. Blood circulation almost stopped. See Supplemental Movie 1 for the complete time-lapse of the embryo in EC culture. The upper panel in this movie shows a full overview of the embryo, while the panel on the lower left visualizes the heart development in full resolution. The segmentation of the presomitic mesoderm into somites can be seen in detail on the lower right. Embryos in the submerged filter paper sandwich, on the other hand, were limited in their three-dimensional expansion only by the natural tension of the membranes surrounding them. They could be cultured either with their ventral (Figure 2B) or dorsal side up (Figure 2C). Either way, the embryos showed continuous somitogenesis, and their heads turned. They developed cranial and cervical flexure and functional blood circulation. 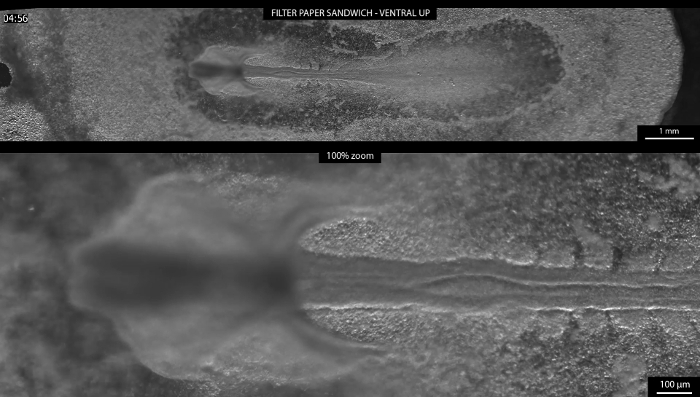 Both embryos in the filter paper sandwich were imaged with the focus on the segmenting mesoderm, so that parts of the head gradually moved out of focus as the embryos grew, thickened, and started to turn, while the segmenting part of the mesoderm remained in focus (compare Figure 2B and 2C at 21 hr to 27 hr). Supplemental Movie 2 shows the complete time-lapse movie of the embryo depicted in Figure 2B. The imaging interval was 4 min. The top panel of this movie shows a full overview of the embryo. The development of the embryo was imaged consecutively over 46 hr, but after approximately 30 hr, the focus on the segmenting mesoderm got lost due to the overall thickening and turning of the embryonic tissue. The lower left panel shows the early development of the heart in full resolution from the acquired time-lapse frames. Through fusion of the paired cardiac primordia on both sides of the midline, a nearly straight tubular structure is formed, which later starts beating and bending to the right. The lower right panel shows the most recently-formed somites and the anterior tip of the presomitic mesoderm in full resolution and tracks the formation of new somites over time. Supplemental Movie 3 shows another embryo cultured and imaged ventral side up in the submerged filter paper sandwich. The imaging interval was 4 min. The movie covers the development of the embryo from stage HH5-6 to approximately stage HH1415, over roughly 27 hr of culture time. The head fold forms and progresses posteriorly. The heart forms from its bilateral primordia, starts beating, and bends to the right. The first three to four somites form simultaneously. Additional somites bud off sequentially from the anterior tip of the presomitic mesoderm. The lower panel shows the head region of the embryo in full resolution, allowing the observation of the head fold and early heart formation in high detail. Due to the transparency of the embryo, the closure of the neural tube can be observed in the future head region. Supplemental Movie 4 displays somite formation in the same embryo in full resolution over the full imaging time in the lower panel. Supplemental Movie 5 shows the complete time-lapse of the embryo cultured dorsal side up (Figure 2C). The imaging interval was 10 min. While the upper panel shows the development of the embryo from the seven somite stage (HH9) to approximately stage HH16-17, the lower panel is cropped to display the morphological changes in the early brain at that stage in full resolution. The local swelling of the neural tube can be observed, leading to the regionalization of the forebrain, midbrain, and hindbrain, which will divide into the five subregions of the embryonic brain at later stages13. In addition, the growth of the optic vesicles can be seen clearly. After approximately 30 hr in culture, the embryo is dying. 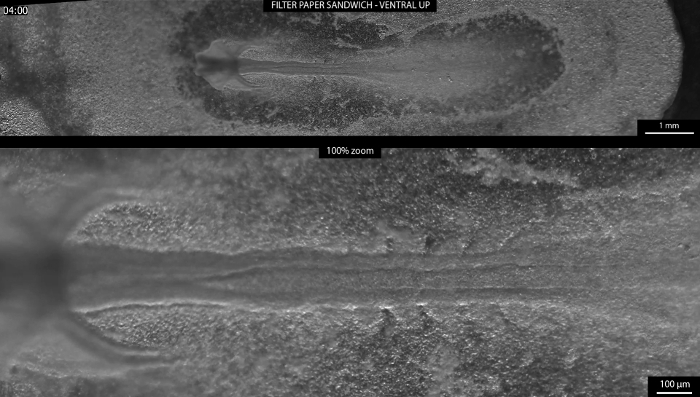 To show the compatibility of the submerged filter paper sandwich with microsurgical manipulations, several polystyrene microbeads (~ 40 µm in diameter) were implanted into or in the vicinity of the presomitic mesoderm of a chicken embryo in the submerged filter paper sandwich culture. The microbeads were washed in PBS to remove storage buffer and implanted prior to covering the culture medium with the layer of light mineral oil (compare to step 2.18 of the protocol section). A glass Pasteur pipette was used to transfer the beads to the embryo surface, under observation through the eyepieces of the microscope. Five holes were created in the endoderm by gently scraping it with an acupuncture needle. A custom-made J-shaped tool, created by stretching and bending a glass Pasteur pipette in a flame, was used to manipulate the beads and push them carefully into the holes until they became immobile. Three holes were filled with one bead each (Figure 3A - 0 hr and 3B*) and two holes with two beads each (Figure 3A - 0 hr). Figure 3A shows, in selected time-lapse frames, the development of the chick embryo after the microsurgical implantation of the beads. Three beads were successfully incorporated into the tissue at the desired location, and their movement was imaged over the course of the experiment in high detail (Figure 3B). The development of the embryo did not seem to be impaired by the manipulation or the presence of the beads. See Supplemental Movie 6 for the full time-lapse movie. The imaging interval was 4 min. 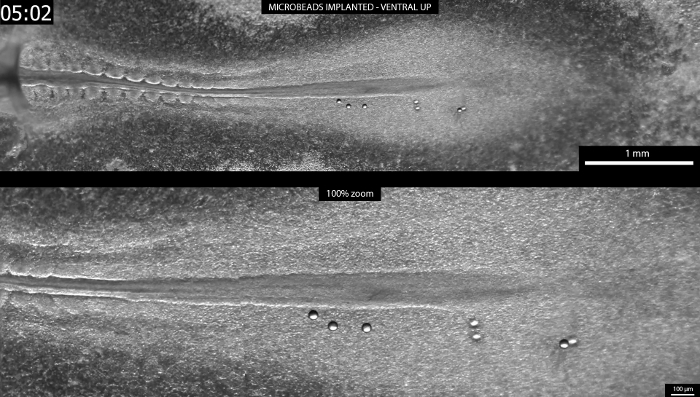 Figure 3: Time-lapse Imaging after Microbead Implantation. Proof-of-principle experiment showing the compatibility of the submerged filter paper sandwich with microbead implantation. The head of the embryo is to the left, but it was not imaged during this experiment. Images were acquired using darkfield illumination. 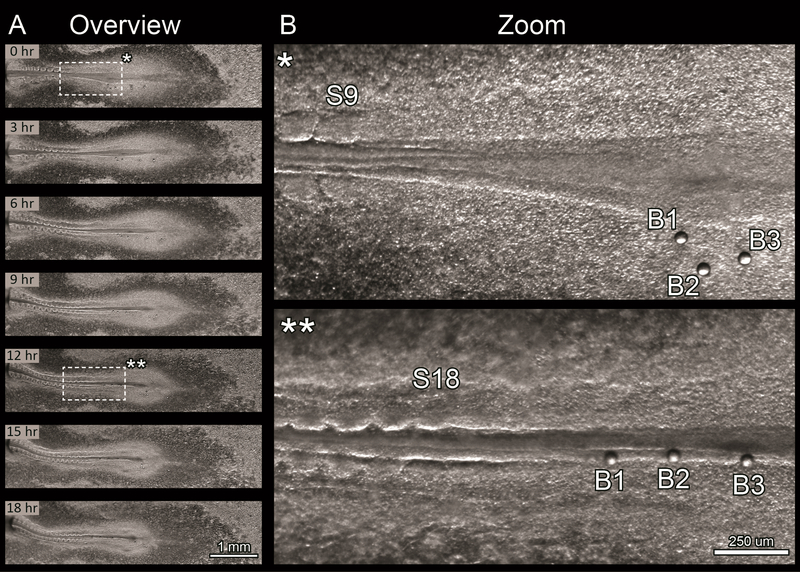 (A) Selected time-lapse frames showing the manipulated embryo at 3 hr intervals after the implantation of seven microbeads (~ 40 µm in diameter). The embryo elongated and continuously formed additional somites. Three beads seem to have been properly attached and moved medially with the tissue flow over 18 hr of culture. The other four beads popped out of their holes between 6 and 9 hr of culture and drifted posteriorly. (B) Detailed view of the three single beads (B1 to B3) implanted into the presomitic mesoderm at beginning of the experiment (0 hr, B*) and after 12 hr of incubation (B**). The number of the just-forming somites is indicated (S9 in B* and S18 in B**). Please click here to view a larger version of this figure. Supplemental Movie 1: EC-culture Ventral Side Up. Embryo in EC culture1, cultured ventral side up, from the seven somite stage (HH9)15 onwards on an agar-albumen bottom1,33. The imaging interval was 4 min. The relative time is displayed in the upper-left corner. High-quality images could be acquired, as the embryo was confined in the z-direction. After 21 hr, the heartbeat and blood flow were almost arrested and the embryo had started to disintegrate. The upper panel shows a resized overview of the embryo, while the lower panels visualize heart development (left panel) and segmentation of the presomitic mesoderm (right panel) in full resolution (100% zoom). (Right click to download). Supplemental Movie 2: Submerged Filter Paper Sandwich Ventral Side Up. Embryo cultured in the submerged paper sandwich from the seven somite stage (HH9)15 onwards, ventral side facing up. The imaging interval was 4 min. The relative time is displayed in the upper-left corner in hr and min, restarting after 24 hr. The upper panel shows a resized overview of the development of the embryo over 46 hr, consecutively. The lower left panel visualizes early heart development during the first 10 hr of image acquisition in full resolution (100% zoom). The lower right panel depicts segmenting mesoderm over approximately 30 hr of development in full resolution (100% zoom) until focus is lost due to overall thickening and turning of embryonic tissue. (Right click to download). Supplemental Movie 3: Head Fold Formation. Embryo cultured ventral side up in the submerged filter paper sandwich from the head-process/head-fold stage (HH5-6)15 to approximately the 22-somite stage (HH14)15 over roughly 27 hr of culture time. The imaging interval was 4 min. The relative time is displayed in the upper-left corner in h and min, restarting after 24 hr. The upper panel shows a resized overview of the development of the embryo. The lower panel depicts the head region of the embryo in full resolution (100% zoom). The formation of the head fold and early heart and the closure of the neural tube can be observed. (Right click to download). Supplemental Movie 4: Somitogenesis. Embryo cultured ventral side up in the submerged filter paper sandwich from the head-process/head-fold stage (HH5-6)15 to approximately the 22-somite stage (HH14)15 over roughly 27 hr of culture time. The imaging interval was 4 min. The relative time is displayed in the upper-left corner in h and min, restarting after 24 hr. The upper panel shows a resized overview of the development of the embryo. The lower panel depicts the segmenting paraxial mesoderm in full resolution (100% zoom). (Right click to download). Supplemental Movie 5: Submerged Filter Paper Sandwich Dorsal Side Up. Embryo cultured dorsal side up in the submerged filter paper sandwich from the seven somite stage (HH9)15 to approximately the HH16-17 stage15. The imaging interval was 10 min. The relative time is displayed in the upper-left corner in hr and min, restarting after 24 hr. The upper panel shows a resized overview of the development of the embryo. The lower panel depicts morphological changes in the early brain in full resolution (100% zoom). The embryo died after approximately 30 hr in culture. (Right click to download). Supplemental Movie 6: Microbeads Implanted. Embryo cultured ventral side up in the submerged filter paper sandwich for approximately 19 hr, starting from the nine somite stage (HH9-10)15. The imaging interval was 4 min. The relative time is displayed in the upper-left corner in h and min. 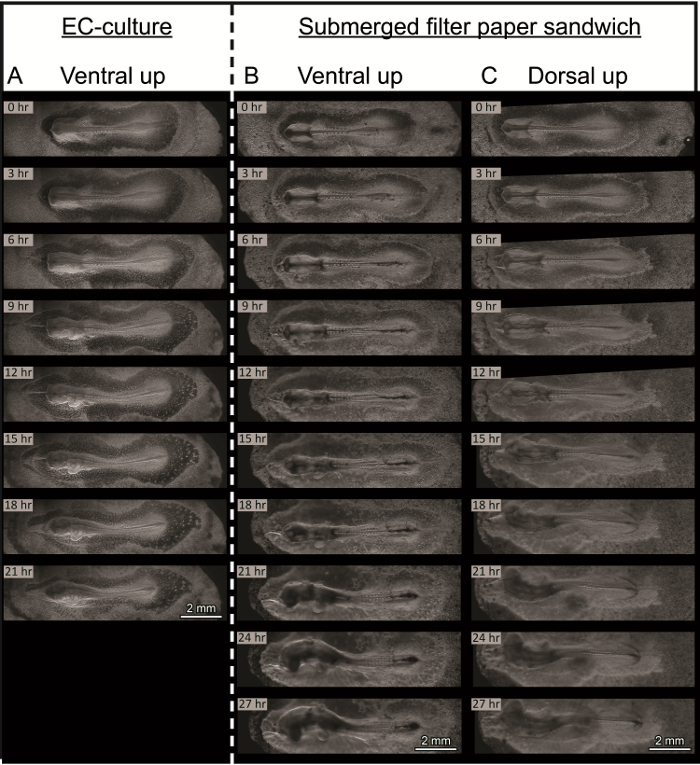 The upper panel shows a resized overview of the tail region with seven microbeads implanted into the presomitic mesoderm. The lower panel shows the region with implanted microbeads in full resolution (100% zoom). (Right click to download). As a new variant of the well-established EC culture1, the submerged filter paper sandwich facilitates the acquisition of long-term brightfield and darkfield time-lapse movies of the early chick embryo ex ovo by making a temperature- and humidity-controlled incubator around the microscope dispensable. Rather than being cultured on a semi-solid agar-albumen bottom, the embryos are kept fully submerged in a simple culture medium consisting of PC-saline and thin albumen. Evaporation and heat loss are minimized by a layer of mineral oil floating on top of the culture medium. Embryos can be cultured easily, either dorsal or ventral side up, without visible differences in quality. As shown here, embryos in the submerged filter paper sandwich are accessible to microsurgical interventions, like the application of morphogen-soaked beads. Future applications include live fluorescence imaging, microinjections and electroporation, and gene silencing to manipulate and study a wide range of morphogenetic events during ventral (e.g., early heart and somitogenesis) and dorsal (e.g., late gastrulation, neural tube closure, and early brain) development. A time-dependent drug treatment is feasible if the Petri dish containing the filter paper sandwich is replaced with a perfusion chamber, allowing the exchange of the culture medium below the mineral oil layer. The submerged filter paper sandwich will develop its full imaging potential in combination with laser-based imaging (including light-sheet microscopy) and immersion objectives. Some difficulties with the preparation of the submerged filter paper sandwich will be addressed in the following paragraphs. Although it requires only a moderate amount of training to transfer an embryo from the yolk into the filter paper sandwich, several steps can still significantly influence the quality of the embryo in culture. Before the filter paper carrier is placed onto the yolk, the vitelline membrane around the embryo should be freed from any thick albumen. Only then will the connection between the filter paper and the vitelline membrane be strong enough to withstand the washing in PC-saline. The filter paper carrying the embryo should cross the liquid/air interface as little as possible to minimize the tension on the membranes. Once brought into the PC-saline for washing, the whole filter paper carrier must stay completely submerged at all times. The time in the PC-saline bath must be limited to about 30 - 60 sec, as the vitelline membrane will start releasing from the filter paper. Still, the cleaning of the embryo should be executed very thoroughly, as yolk remnants will later obscure the view of the embryo. During washing, never point the stream from the transfer pipette directly onto the embryo, but always radially away from it. After removing the embryo from the PC-saline, make sure to hold the filter paper horizontally to minimize tension on the embryonic membranes. Then, stabilize the embryo with the second filter paper carrier. Once the second filter paper carrier is placed, avoid creating any lateral tension, which could shift the filter paper carriers relative to each other and tear the embryonic membranes. When the filter paper sandwich is brought into the culture medium, it should also cross the air/liquid interface only once to minimize tension on the membranes. The second pair of stainless steel rings used to stabilize the filter paper sandwich from the top should be placed very slowly and without any pressure to minimize compression of the embryonic membranes. Small ruptures of the area opaca of the embryo usually heal during the first hour of culture, but a damaged embryo can and should always be replaced by a new sample before the oil layer is pipetted on top of the culture medium. To image an entire embryo or multiple samples for high-resolution time-lapse movies, the microscope must be equipped with a motorized x-y-stage, controlled by the microscope software. It is of crucial importance to have the x-y-stage move with a minimal speed to avoid damage to the embryos and turbulences in the culture medium and the oil, which will decrease the image quality. For the acquisition of the time-lapse movies presented here, the motorized x-y-stage moved with a speed of approximately 1.75 mm/sec. In the future, imaging could be further improved by first moving the stage to the desired position and acquiring the image after a short rest period to let vibrations and turbulences fade away. As a limitation, potential users should be aware of the relatively long working distance (approximately 1 cm) necessary for this culture method if an upright microscope without immersion objectives is used. This working distance results from the layer of medium and of mineral oil on top of the embryo. In the 6 cm Petri dish, the oil layer has a thickness of approximately 1 - 1.5 mm, and the embryo is submerged approximately 4 mm deep in the culture medium. Depending on the diameter of the objective, the upper edge of the 6 cm Petri dish could also limit access to the embryo. This could be circumvented by using a larger dish. The working distance from the top could be slightly reduced by minimizing the thicknesses of the liquid layers. In addition, the working distance from below could be minimized by bringing the embryo further down to the bottom of the Petri dish and reducing the thickness of the glass window of the heated beaker. While the protocol was optimized to work with an upright long working distance zoom microscope, it could be fitted to an inverted microscope as well. Future users should keep in mind that submerging the embryo too deeply in the culture medium might lead to O2-diffusion problems, although preliminary experiments suggest that limited diffusion does not seem to be a problem, as long as the embryo is surrounded by a sufficiently-large reservoir of culture medium and the filter paper sandwiched is not pressed to the bottom of the Petri dish. Another limitation is the temperature control. By adjusting the temperature of the controller for the heated beaker to 40 °C, the temperature in the medium equilibrates to 37.5 °C around the embryos when the medium is covered with mineral oil. This shows that some energy is lost between the bottom of the beaker, where the heating elements and the temperature sensor are located, and the location of the embryos. The temperature control could be optimized by relocating the sensor and redistributing the heating elements. The authors acknowledge financial support from a ZonMW-VICI grant 918.11.635 (The Netherlands). The authors would like to thank the tool shop of the Vrije Universiteit Amsterdam for their practical suggestions and for manufacturing the setup components and Jarno Voortman of Carl Zeiss Netherlands for helpful advice on microscopy. Marjolein Blaauboer was a great support in critically commenting on several drafts of the manuscript. Chapman, S. C., Collignon, J., Schoenwolf, G. C., Lumsden, A. Improved method for chick whole-embryo culture using a filter paper carrier. Dev. Dyn. 220, (3), 284-289 (2001). Rozbicki, E., et al. Myosin-II-mediated cell shape changes and cell intercalation contribute to primitive streak formation. Nat. Cell Biol. 17, (4), 397-408 (2015). Smith, J. L., Schoenwolf, G. C. Neurulation: Coming to closure. Trends Neurosci. 20, (97), 510-517 (1997). Schoenwolf, G. C., Sheard, P. Shaping and bending of the avian neural plate as analysed with a fluorescent-histochemical marker. Development. 105, (1), 17-25 (1989). Colas, J. F., Schoenwolf, G. C. Towards a cellular and molecular understanding of neurulation. Dev. Dyn. 221, (2), 117-145 (2001). Pourquié, O. The chick embryo: a leading model in somitogenesis studies. Mech. Dev. 121, (9), 1069-1079 (2004). Maenner, J. Cardiac looping in the chick embryo: A morphological review with special reference to terminological and biomechanical aspects of the looping process. Anat. Rec. 259, (3), 248-262 (2000). Wittig, J. G., Münsterberg, A. The Early Stages of Heart Development Insights from Chicken Embryos. J. Cardiovasc. Dev. Dis. 3, (2), (2016). Layer, P. G., Alber, R. Patterning of chick brain vesicles as revealed by peanut agglutinin and cholinesterases. Development. 109, (3), 613-624 (1990). Nakamura, H., Nakano, K. E., Igawa, H. H., Takagi, S., Fujisawa, H. Plasticity and rigidity of differentiation of brain vesicles studied in quail-chick chimeras. Cell Differ. 19, (3), 187-193 (1986). Garcia-Lopez, R., Pombero, A., Martinez, S. Fate map of the chick embryo neural tube. Dev. Growth Differ. 51, (3), 145-165 (2009). Andermatt, I., Stoeckli, E. T. RNAi-based gene silencing in chicken brain development. Methods Mol. Biol. 1082, 253-266 (2014). Tufan, A. C., Akdogan, I., Adiguzel, E. Shell-less culture of the chick embryo as a model system in the study of developmental neurobiology. Neuroanatomy. 3, (1), 8-11 (2004). Endo, Y. Chick embryo culture and electroporation. Curr. Protoc. Cell Biol. Unit 19.15 (2012). Hamburger, V., Hamilton, H. L. A series of normal stages in the development of the chick embryo. J. Morphol. 88, (1), 49-92 (1951). Kulesa, P. M., Bailey, C. M., Cooper, C., Fraser, S. E. In Ovo Live Imaging of Avian Embryos. Cold Spring Harb. Protoc. 2010, (6), (2010). Borwompinyo, S., Brake, J., Mozdziak, P. E., Petitte, J. N. Culture of chicken embryos in surrogate eggshells. Poult Sci. 84, (9), 1477-1482 (2005). Yalcin, H. C., Shekhar, A., Rane, A. A., Butcher, J. T. An ex-ovo Chicken Embryo Culture System Suitable for Imaging and Microsurgery Applications. J. Vis. Exp. (44), e2154 (2010). Auerbach, R., Folkman, J. A simple procedure for the long-term cultivation of chicken embryos. Dev. Biol. 41, (2), 391-394 (1974). New, D. A. T. A New Technique for the Cultivation of the Chick Embryo in vitro. J. Embryol. Exp. Morphol. 3, (4), 320-331 (1955). Stern, C. D., Bachvarova, R. Early chick embryos in vitro. Int. J. Dev. Biol. 41, (2), 379-387 (1997). Nagai, H., Lin, M. C., Sheng, G. A modified cornish pasty method for ex ovo culture of the chick embryo. Genesis. 49, (1), 46-52 (2011). Connolly, D., McNaugbton, L. A., Krumlauf, R., Cooke, J. Improved in vitro development of the chick embryo using roller-tube culture. Trends Genet. 11, (7), 259-260 (1995). Rupp, P. A., Rongish, B. J., Czirok, A., Little, C. D. Culturing of avian embryos for time-lapse imaging. Biotechniques. 34, (2), 274-278 (2003). Martins, G. G., Rifes, P., Amaândio, R., Rodrigues, G., Palmeirim, I., Thorsteinsdóttir, S. Dynamic 3D cell rearrangements guided by a fibronectin matrix underlie somitogenesis. PLoS One. 4, (10), e7429 (2009). Nagai, H., Sezaki, M., Nakamura, H., Sheng, G. Extending the limits of avian embryo culture with the modified Cornish pasty and whole-embryo transplantation methods. Methods. 66, (3), 441-446 (2014). Pannett, C., Compton, A. The Cultivation of Tissues in Saline Embryonic Juice. Lancet. 203, (5243), 381-384 (1924). Voiculescu, O., Papanayotou, C., Stern, C. D. Spatially and temporally controlled electroporation of early chick embryos. Nat. Protoc. 3, (3), 419-426 (2008). Carl Zeiss Microscopy. GmbH Software Guide ZEN 2 - The Tiles & Positions Module. Available from: http://applications.zeiss.com/C125792900358A3F/0/9943124DA6FFBA5DC1257E9300412F8B/$FILE/ZEN2_Tiles_and_Positions_Module_Software_Guide.pdf (2015). Carl Zeiss Microscopy. GmbH ZEN 2 - (blue edition) - Software Guide. V1.0 en, Available from: https://www.unige.ch/medecine/bioimaging/files/3914/3765/2064/ZEN_2_blue_edition_-_Software_Guide.pdf (2014). Carl Zeiss Microscopy. GmbH Quick Guide ZEN 2 - Acquiring multidimensional images. Available from: http://applications.zeiss.com/C125792900358A3F/0/5D9162DBD5AF85DDC1257E35005A68A6/$FILE/ZEN_2-Acquiring_multidimensional_images.pdf (2014). Carl Zeiss Microscopy. GmbH Quick Guide ZEN 2 - Importing and exporting images. Available from: http://applications.zeiss.com/C125792900358A3F/0/CF6F8A3FE82E5870C1257E35005AF3E9/$FILE/ZEN_2-Importing_and_exporting_images.pdf (2014). Darnell, D. K., Schoenwolf, G. C. Culture of Avian Embryos. Dev. Biol. Protoc. Vol. I. 135, 31-38 (2000).